Before I get to today's challenge, I would like to point you in the direction of a challenge we still have running until Sunday 9th June. #92 Tri-Shutter Card. As I mentioned in that post, I made a mistake when scheduling posts and we ended up with two posts in two weeks. Originally I was going to only run the Tri-Shutter card post for one week, but realise that we were asking you to create something you may not have tried before and wanted to give you a little longer to have a go in you wanted to. So that post will run now until 9th June and the one below will run until 16th June. Please feel free to enter either challenge, or even both! 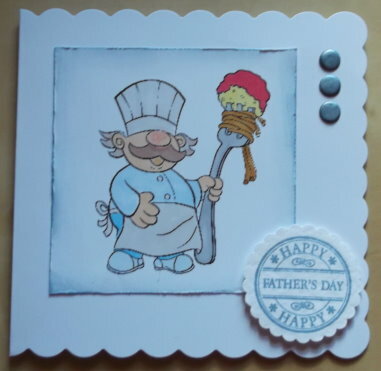 As it's Father's Day here in the UK on 16th of June Feebsy would like to see anything you've created for or have been inspired to make by an important male figure in your life. It could be anything from a card, a scrapbook page, a knitted scarf or a piece of altered art. It does not have to be specifically for Father's Day ( I don't want you spoiling a surprise for anyone) but let us know the inspiration behind your work. Please ensure you let us know the inspiration behind your work to qualify for a winner or Top 5 slot. If you are looking for fun, cute and lovely digi stamps for your paper-crafting or web design projects, The Paper Shelter is your one-stop boutique! This growing catalog of high-quality digi stamps with many different kind of options offers a multitude of themes such as everyday items, holidays, special occasions, children, adorable characters and creatures. Stamps are available in standard black and white line art, as well as in pre-colored format. Images are wonderful for coloring and make perfect additions to greeting cards and scrapbook albums. In "The Paper Shelter" you'll also find great other resources for all crafts (or digital) projects, like Paper Packs, Printables, Accessory sheet, etc. with a £12 voucher to be spent at one of their Retailers. My father recently retired and began to indulge in his passion for photography. I found this fun camera image for free at U printables by RebeccaB. They're simply coloured with Promarkers and glossy accents have been added to the lens and flash. Remembering the smartest dressed man I knew when I was growing up! 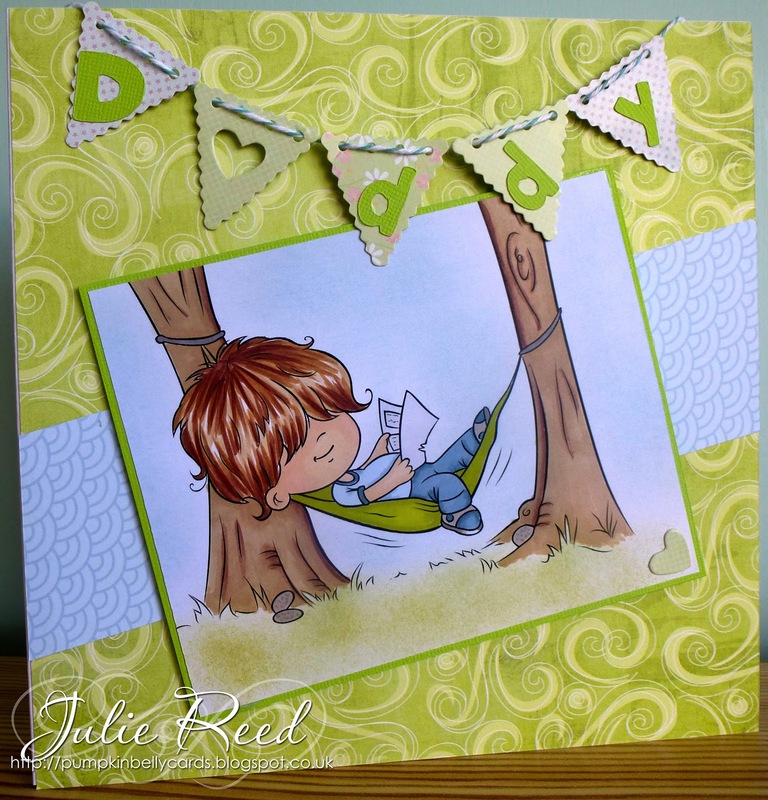 Used the Umbrella man die cut and assorted papers for this card, together with a word stamp, which reflects the way my Dad was always there for me. 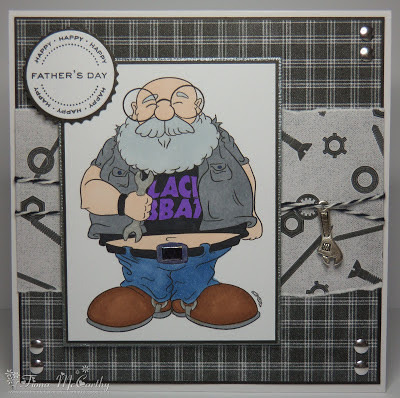 For my card I have used a digi stamp from Just Inklined called Aubery Bumblethorpe"(he really looks like my Dad lol) My papers are digi papers from a Nitwits collection called "Assembly Too" I have added twine,charm and nailheads from my stash. the Hammock there. The image is from The Paper Shelter and called 'Happy Times'. This card is perfect for my Dad as I always enjoy his barbecues. Must get one organized as the weather is so nice.. I have used the Trattoria Chef image from The Paper Shelter coloured using promarkers. Sentiment stamp is LOTV. 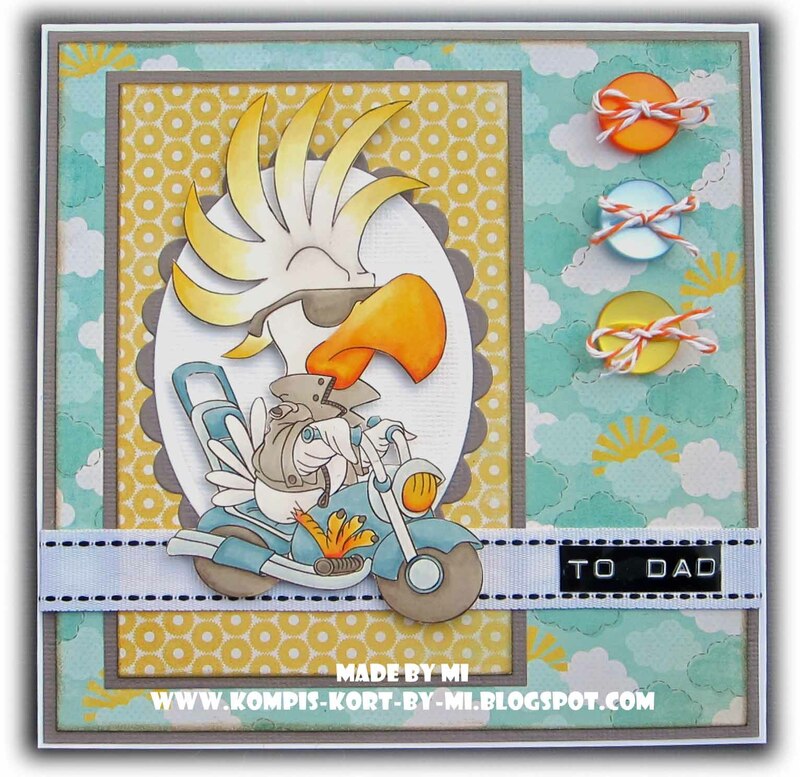 A card for dad, well we don't celebrate Father's day in Sweden until November so I might be a tiny bit early with this card. LoL Anyway, the image is from the Paper Shelter and is an oldie but still one of my favourite images. He is coloured with my Letraset family and designer papers from My Mind's Eye called Fine and Dandy boy paper pad. A bit of muted strong summer colours in there. 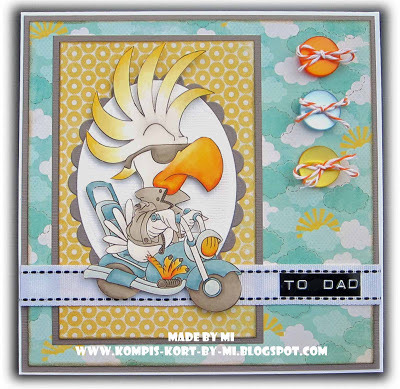 Perfect for a motorbike ride kind of card. A few buttons, a ribbon and some twine complete it all. I coloured my image with Promarkers and added simply layered it onto some grungy paper from K&co. TO add a bit of extra detail I put glossy accents on some of of the spots and the beer mug. My Grandad was the main ‘father figure’ in my life until he sadly passed away 20 years ago. He was a real character and we spent every weekend with him and my Granny out and about in his old Morris Minor car! 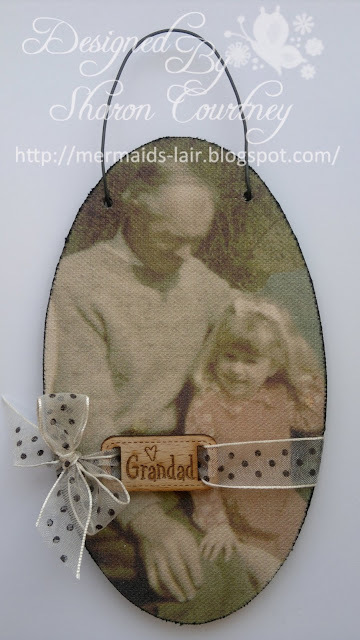 Happy memories inspired me to print a lovely old photo of myself (aged 2) and my Grandad onto some canvas and make into a wallhanging. 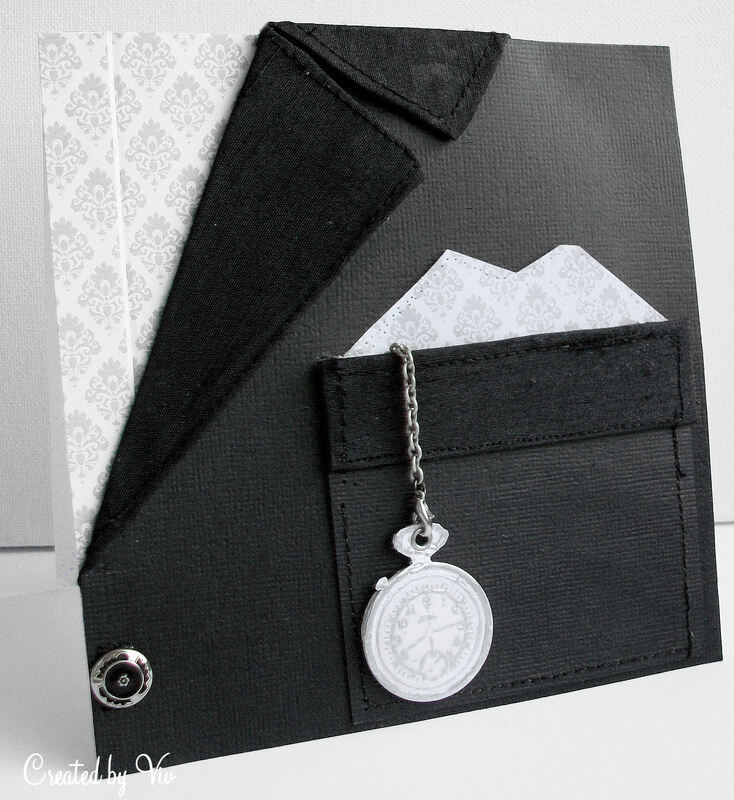 I distressed the edges with Black Soot DI and added a wooden tag sentiment and bow. My dad loves cowboy films, gardening and making lists! So I made some handy notebooks. I used an image from our sponsors, Paper Shelter, for my main image, which I coloured with my coloured pencils. 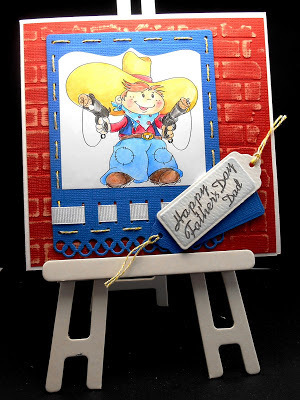 I used a creative expressions embossing folder for my brick background, and a nestie for the topper base. The Paper Shelter. I fussy cut the images and popped them with foam tape. 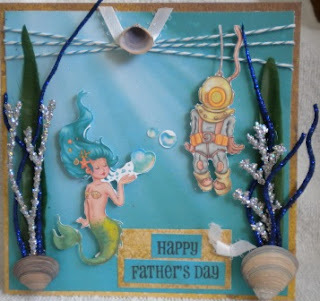 I even used real seashells as embellishments. I chose "Enchanted Ocean" because my hubby has been scuba diving for 20+ years and all divers dream of seeing a mermaid. Whenever I think of my Dad, now sadly no longer with us, I always think of the garden and wild birds. I can close my eyes now and see him sitting at the table under the window watching the wondrous array of wild birds that graced the bird table and assorted shrubs and bushes. 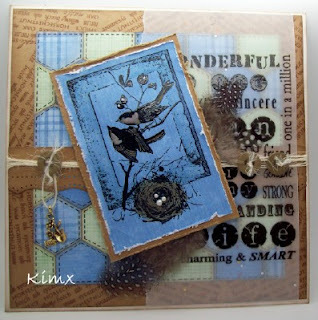 More details on my blog, but this is why I chose this lovely Stampendous stamp available through one of our Sponsors Woodware Craft Collection for my card. 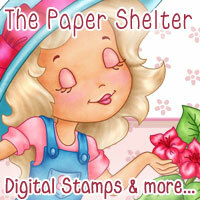 I have used a digi stamp from our sponsors, The Paper Shelter, called My Little Garden. My Dad is retired and now spends his days in his little garden. I have used my promarkers to colour it in. I made this card for my SIL, as he is the most important male figure in my life since he took over the role of protecting, nurturing and inspiring my beautiful Daughter. Sadly she didn't have the same fabulous male influence that I had in my own Dad, and until Steve (my SIL) came along she was actually a bit lost. He completes her and I am so happy they found each other. He collects Native American Art and figures and so I put a lot of effort into creating this card for him. More details as to how I created it will be on my own blog. Lovely techniques used for all the inspiration. Thank you! Great cards and projects. Thanks for the challenge. Great inspiration by your team! What a great cards! 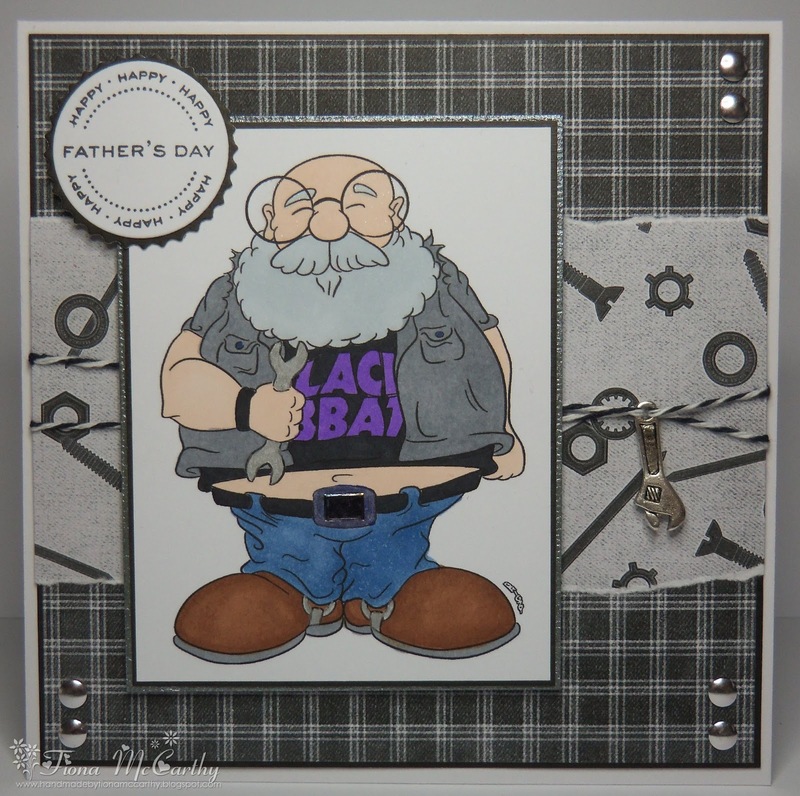 Happened to make two father's day cards myself yesterday. Gonna upload and share them today. Compliment for the welldressed man card. Love it!! !